In Kansas City at the Romantic Times Convention! The dress and coat are both done, no thanks to me since I got sick the last couple of days and couldn’t even help with the handwork. The best I could do was show up for fittings, pose for pictures, and eventually, pack up the car for the 1200-mile trip from the Florida retirement community to Kansas City. I still feel a bit like the wicked stepsister, taking off for the ball while leaving Cinderella at home to prepare two houses (mine and hers) for the summer while we head back to Ohio. I seriously owe you, Mom! My mom’s a genius! Not only did she do a fantastic job on both garments, but she sewed on hanger loops and outfitted me with a needle and thread in case something goes wrong. She really deserves to be here at RT on Wednesday night when I wear it to the Ellora’s Cave disco party (not going to do any disco dancing, however) and the 30th Anniversary Ball on Thursday. I’ve promised photos, and they’ll be posted here as well. This is not a project for an amateur. I could never have done this myself, and I do have some sewing experience. The fitted bodice required a LOT of pattern alterations, since we couldn’t use any sort of stretchy fabric and still remain anywhere close to authentic. The gown my sister had made had two separate drawstrings in the bodice to make it more fitted, since she was not available for fittings. That turned out well, but I’m not sure that would have worked well with the pattern we used. How much did I spend on this project? But it’s not about the money. It’s never been about the money. It started with my friend Ellen’s idea for promoting Susana Ellis the author at conferences like this one (although I suspect that I will not be the only one in costume here.) But it became so much more than that. I never could have guessed how much my mother and I bonded during this process—from the first days of discussing the project to the difficult decisions about fabric choice (would you believe we originally intended the blue satin to be the gown and the cream pintuck taffeta to be the coat?) and many setbacks (like when the sleeve had to be redone and then we had to abandon the project for a few days to head north for a funeral) and wondering if it was possible to finish both garments in time for the conference. Surprisingly, even my father became invested in this project. During the times when he seemed to have some health setbacks himself and Mom started worrying about having to head north earlier than planned and not being able to finish the coat, he told her to quit worrying about him and just finish it! He wanted to see the final product as much as we did, and thus, he started working harder at his physical therapy exercises (he has Parkinson’s). I’m writing this on Wednesday, so by the time this goes live, the first event (the Ellora’s Cave disco party) will be over and hopefully I will have some photos to post. I’m planning to wear the gown for a Club RT appearance at 3:30, and then comes the stage walk with the Ellora’s Cave caveman. Oh yeah! Click here for the video of the walk across the stage! On Thursday I’ll be wearing it for the Expo from 4-6 and then the RT ball in the evening. On Friday morning I have another appearance at Club RT. By then I’m sure it’ll be ready for the dry cleaner’s and the next opportunity, probably the RWA Conference in Atlanta. If you are going to be at any of these events, please come up and chat with me and check out the gown in person. I’m looking forward to making lots of reader-author friends while I’m here, and I do hope you will be one of them! 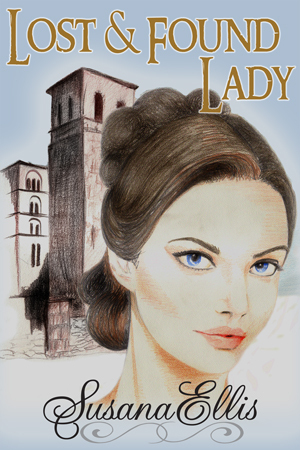 Warning: don’t be surprised if I ask you to be “lady’s maid” for me! Regency ball gowns were generally worn by well-off young ladies with abigails to assist them in dressing, and unfortunately, my first choice in lady’s maids—my sister Gloria—had to stay home with her cat. Where is a hunky Ellora’s Cave caveman when you need one? Oh, and in case you’re wondering: Mom is NOT interested in taking this up as a profession or a hobby. Being retired in itself is a very time-consuming activity. Once is enough…and I’m the lucky one! 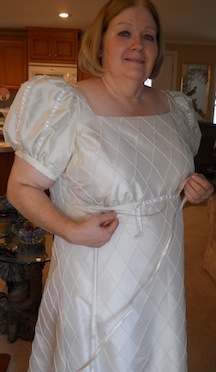 This post is part of a mini-series about the experiences of my mother and me in creating a Regency gown for the Romantic Times Convention on May 1-5, 2013 in Kansas City. You can find Episode 1, where we shopped for fabric and struggled with cutting out the dress pieces here. I tried the dress on and it fits!!! It’s not finished yet. The fastening at the back remains to be done, plus the hem and lots of trim. But it does look like a dress now, and it does look pretty good on me, if I do say myself! However, we had a bit of a setback a week ago when my uncle died unexpectedly and we all had to fly north for the funeral. It was cold and nasty and, well, sad, because we had to say goodbye to Uncle Bob, but it was good to see friends and family we haven’t seen for years. We still have a couple of weeks left, though, before I have to take off for Kansas City, and it’s quite likely we’ll have the blue satin coat done too, by that time. She’s already got the pieces for the gown and the lining cut out, as well as the organdy ruffle at the collar and the sleeve stays. We think this will go faster than the gown, since she’s already worked out the fit issues. But it is still rather a complicated design and she’s something of a perfectionist, so she’ll be putting in a lot of hours. That worries me a little bit, because I don’t want her to wear herself out. I try to help with lunch and errands and Dad, but I am seriously going to owe her after this. Big time. She also just had her 75th birthday on April 15th and wouldn’t let us buy her anything. 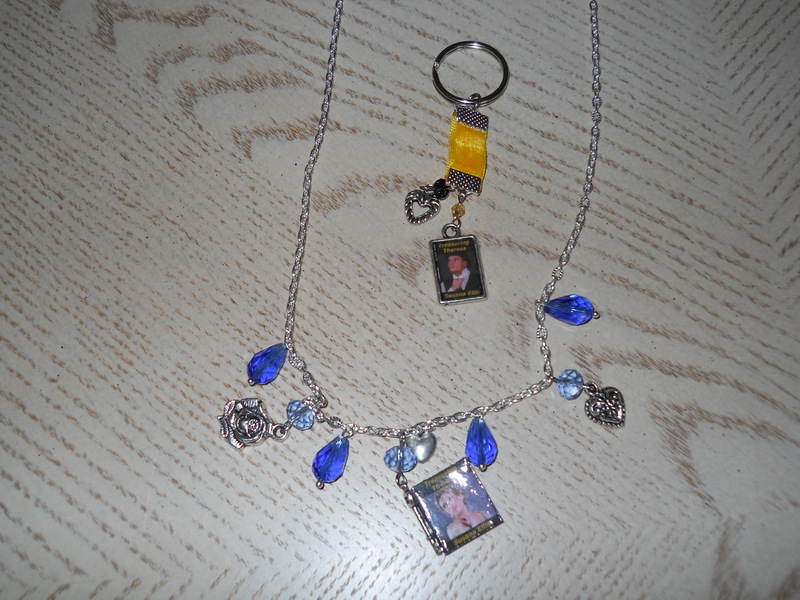 Of course, I did give her a Treasuring Theresa necklace (see below), but I’m going to have do something really nice for her for Mother’s Day this year. Hmm. What can you give someone who doesn’t want you to “waste” money on her? Please comment with any suggestions you may have of how I can show my appreciation to Mom for her commitment to this massive project. One random commenter will receive a Treasuring Theresa keychain (see above), with Damian on one side and Theresa on the other). P.S. 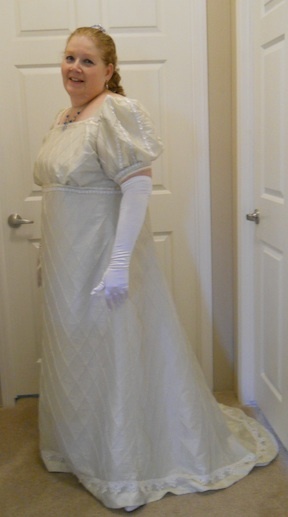 Here’s my sister Gloria (aka Letitia, Lady Beauchamp) in the Regency gown she had made from an artisan on Etsy recently (and the hat our mother made). I offered to take her with me to the RT Convention as my lady’s maid (trust me, somebody is going to have to help me in and out of this gown), but she said she can’t leave her cat that long. A cat? Really? Hmm. At least I know where I stand! 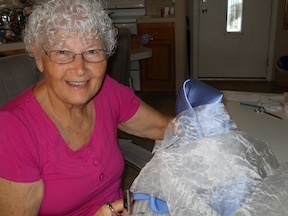 Stand by for further reports on the progress with “The Dress.” The deadline approaches, but I have perfect confidence in my mother’s abilities. Oh, and in case you’re wondering: Mom is NOT interested in taking this up as a profession or a hobby. Being retired is in itself very time-consuming. Once is enough for her…and I’m the lucky one! 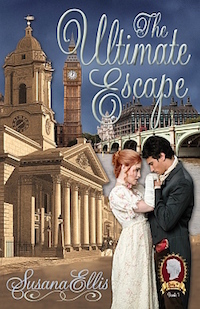 The idea of wearing a Regency gown to the Romantic Times Book Convention (as well as book signings and other events) originated with my friend Ellen, who has lots of experience promoting her teacher books in conference exhibit halls. She said I should stand in front of the table, not behind it, wearing a period gown, and have a list of questions about the Regency period to ask in exchange for prizes. Wow, that sounded like a lot of fun to me, so I started looking around for gowns. I found a pattern on etsy.com and ordered it (have since found you can get it at Jo-Ann’s in the Butterick catalog), and my mom, who is a superb seamstress, offered to make it for me. (Actually, it’s a gown and coat both.) I don’t think at the time she realized how complicated it was going to get, but she is a woman of her word and determined to see it through. The first obstacle was shopping for materials. For one thing, fabric has changed a great deal in 200 years. While there are many beautiful fabrics today, many with sparkly threads and sequins that would look great on me, we had to bypass those and look closer to find fabrics that might at least resemble a Regency-era fabric. It was a painstaking process, because as soon as we found something we thought would be perfect, we’d discover there wasn’t enough fabric on the bolt, which turned out to be a constant problem. For some reason, fabric manufacturers have started putting less fabric on the bolts, so unless you find a brand new bolt, chances are there won’t be enough fabric for a long gown on it. Rats! 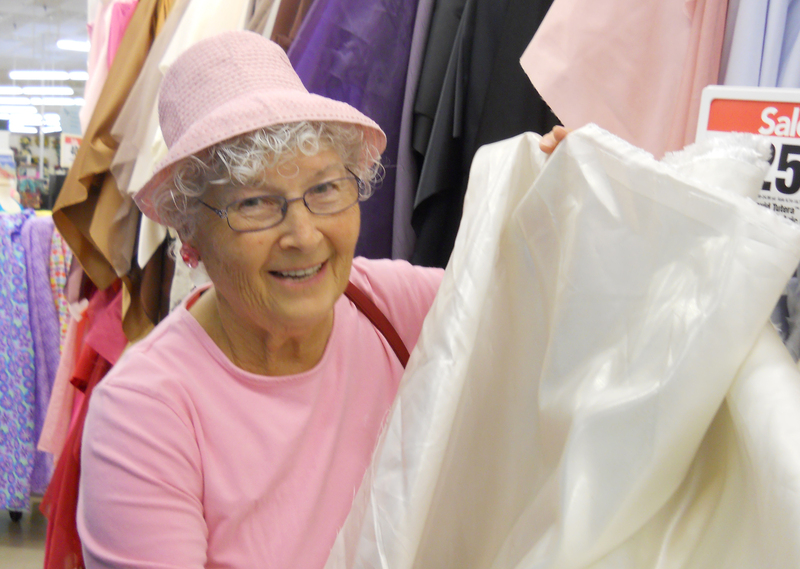 We had this problem with the lining fabrics as well as the gown and coat, and had to find another Jo-Ann’s Fabrics in the next town to get enough. And buy a yard or two extra to make sure we had enough for the extra-long skirt pieces. Eventually, we ended up with an off-white pintuck taffeta for the gown and a blue satin for the coat. But that wasn’t the end, because these garments require lots of decorative trim. The coat has an organdy trim at the neckline, but the clerk at the fabric store had never heard of organdy! But we found something that seemed like organdy that will work. 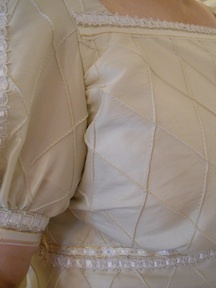 Then we needed several kinds of trim for the sleeves and empire waist for the gown and for the coat as well. The problem with this was that it couldn’t be anything too white, and it had to be a specified width. Inevitably we’d find the perfect trim and find that it was too wide or narrow. As far as the cost, well, that could not be a concern. It was hard enough to find something that would work at all. There was no way I was going to take the time to shop around all the fabric stores in Central Florida to find stuff on sale. Not when this project has to be finished before I leave for RT on April 28! Thanks to Mom, we did have a 15% off coupon, though! In case you’re wondering, this is definitely not an economical project. I have already spent quite a bit on Regency shoes from American Duchess (with beautiful shoe clips), period stockings, a ringlet hairpiece, and gloves, in addition to the fabric and notions that were so hard to find. (Obtaining the proper undergarments to give me the right shape was also quite costly.) My philosophy is you either do it right or not at all. So I’m not sweating the small (or the large) stuff. 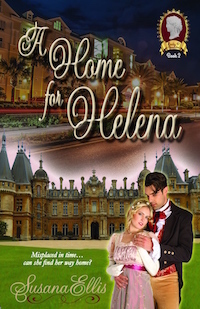 And it’s all tax-deductible for a Regency author, right? So this week we got all the materials and started pulling out the pattern pieces and laying them out on the fabric. We started with the lining, moving the kitchen table in my folks’ house so that we could cut on the floor. NOT a great idea at all! We both ended up with aching backs from maneuvering ourselves into uncomfortable positions and having to get up and down off the floor so many times. After that, we decided to take everything down to the clubhouse (we live in a retirement community in Florida during the winter), move a few tables together, and do our cutting there. Voilà! SO much better. So now we have the lining and dress pieces cut out and ready to put together. And a few people came in to get their mail and wondered what we were doing, so I took the opportunity to give them a bookmark for Treasuring Theresa. All good! One thing that rather astonished me is the need for proper fitting. My own feeble sewing efforts have involved buying the fabric and the pattern and hoping it would fit by the time I was done. That might work with knits and stretchy fabrics, but not with Regency-era fabrics. No indeed. The bodice and the sleeves, at least, have to be fitted closely to the body, and it’s a painstaking process that I couldn’t do in a million years. Thank goodness I have a mother who not only knows how to do it but is willing to put in the hours and hours it takes to make things work! First she worked on altering the pattern; in spite of having lost 30 pounds recently, the pattern still needed to be made larger to fit properly. Somewhat humiliating, but there’s no point in having a gown that won’t fit! Once she had the pattern right, she could cut out the lining and make a few more adjustments. 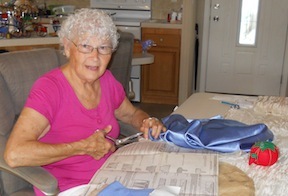 Now she knows exactly what needs to be done with the bodice of the dress too, where there’s less room for error. It turns out Mom and I make a pretty good team. She’s the brains and I’m the brawn. And the cook. 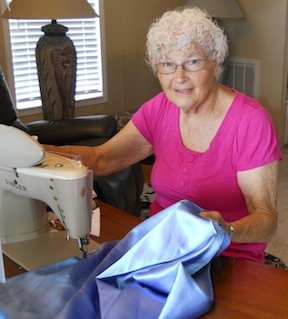 I provide lunch every day and help her with simple things in the afternoon, like pinning the pattern pieces to the fabric, moving around tables and chairs, cleaning up afterward, things like that. My mornings are devoted to writing. I’m hoping to finish the first draft of Cherishing Charlotte in the next few days and then go over it and add some final touches before sending it off to my wonderful critique partners. 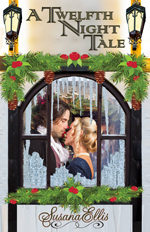 Then I have another novel to finish, plus a Christmas story to submit for the Ellora’s Cave Christmas Cotillion anthology. Would like to finish all three projects before heading to Scotland on June 20! 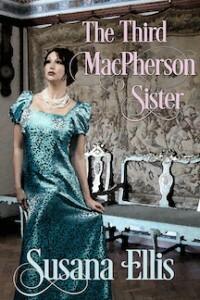 Oh, by the way, my sister Gloria (aka Letitia Beauchamp) also has a Regency gown that she had made. She’ll have to come to some book signings with me to wear it. 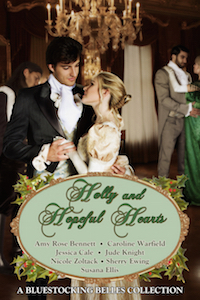 I wonder if her husband Mike (aka Lord Beauchamp) would consent to having a Regency outfit made for him? Sounds like a plan to me! Oh, and in case you’re wondering: she is NOT interested in taking this up as a profession or a hobby. Being retired in itself is a very time-consuming activity. Once is enough…and I’m the lucky one!